Following the downing of the Malaysian Airlines flight killing nearly 300 tourists and air crew The presumed involvement of the seperatists in this horrible act has cast them even further in the role of the bad guys in the conflict raging between Ukrainian Government forces and the pro Russian Militias. There is a counter narrative of course seldom heard in the West. That is of a group of Russian speaking Ukrainians who feared that their language rights and economic needs were about to be subsumed amidst the euphoria emerging from the overthrow of Russophile Party of the Regions earlier in the year. The revolution centered on Indepedence (Maidan) square in Kiev espoused a greater assertion of Ukrainian nationalism championed by groups such as the Right Sector and Svoboda both of which are percieved as fascist even NAZI by pro Russian activists in the Donbass region in which many citizens still harbor a degree of nostalgia for the former Soviet system . Russians cannot forget or forgive the idealogical links these parties have to the Ukrainian resistance movement of Stepan Bandera who fought for Ukranian independence against the Russian dominated Soviet State. Despite Bandera’s arrest and detention by the distrusting Germans, his Ukrainian Nationalist miltias often fought alongside regular German Amy forces in Ukraine against Soviet forces. The decision to install Bandera by outgoing President Yuschenko as a national hero in 2010 raised the hackles of many Ukrainians, both Russian and Ukrainian speakers alike. Not least those Soviet veterans that had suffered directly from the NAZI invasion. The initial pro Russian protests in April that called for federalisation rather than indepence or Anchluss with Russia, saw local activists arrested by the SBU the Ukrainian KGB equivalent. Arrests and detentions of activists such as DNR “Peoples Govenor” Paul Gubarev led to the kidnapping of officials loyal to Kiev, the storming of police stations and the militarisation of the conflict. Just how much direct interference there has been from Russia is unclear, the rebels equipment has been supplemented from the Russain side of the border without doubt including Grad rocket systems and Russian Man Pad rockets. Whether the equipment has been facilitated by the Russian central government or by rogue elelments acting independently allocating quasi surplus equipment is not certain. The seperatists do not have massive amounts of materiel and they have been pushed back from key towns such as Sloviansk in the past month. During this retreat back into the major centres of Donetsk and Luhansk seperatist leaders have berated President Putin for not coming to their aid. Before the MH-17 crash I and other Journalists were aware that delagations of DNR activists were in Moscow frantically attempting to muster support from political figures close to Putin and the Kremlin. Against this background for most ordinary people on the ground in Eastern Ukraine there are no good guys or bad guys just too many people with guns and rockets who are holding sway over their lives. In the case of ordinary Ukranians the Ukranian National Army are far from the good guys and for many with good reason. I have come across one such family of Ukranian Russian speakers in their mid thirties with a young child, living in the Ukranian border town of Amvorieska. Professionals working as an eletrical engineer and draughtswoman, the couple and their young son enjoyed a high standard of living povided by their combined salaries of around 50,000 dollars. Last month a Ukrainian National Army rocket unit had established a base just outside Amvorieska on the road linking Donestk and Rostov in Russia. The family’s happy existence came to an abrupt and violent end in the early hours of June 15th as two Ukranian Army missiles crashed into their house. One half of the couple Alinna described the incident saying “We were very lucky that night, because my husband decided to sleep with the baby in another room. ‘My friend visited and she and I sat together chatting in the kitchen. At 2:30 am, I saw through the window something flying towards the house., and a second later it was within 2 metres a 1 metre flying projectile. The projectile broke through two walls in the kitchen and continued into the yard. Seconds later in the middle of the house a beam fell from the roof onto my son’s playpen smashing it into smithereens, it also broke through the walls in the kitchen. We were so lucky that the first missile flew through the house, during this time we managed run out into the street. “My husband grabbed our son and we all went down into a basement in a neighbour’s house. The shelling lasted for about 30 minutes. After the bombardment the couple emerged to be confonted by a scene of complete destruction. Alinna continued. “There was almost nothing let of our home, roof walls, windows everything was destroyed All our stuff were under a pile of building stones! At least another five homes in the village were destroyed and 25 damaged. The family has now sought refuge amongst their ethnic kin folk, understandably they are terrified of their future in Ukraine amongst Ukrainians, Alinna explained: “Now we are in Taganrog (Russia),we escaped right away – on the next day after the incident. “Next week we go to Moscow to relatives. They promised to help with the work and give the apartment for free for a year. That’s it! “It seems peoples lives from the Donetsk region are unpredictable for a long time to come. “All is well today and tomorrow you are on the street without any documents and possessions and without a roof over our heads. Despite the family’s desperate plight the compensation they received from the Ukranian State in the first instantce amounted to little more than two hundred dollars. 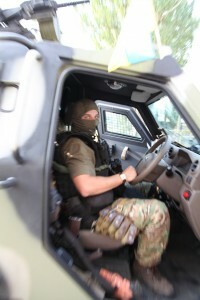 Apart from the emergency payment there was no help or even interest from any other official body The Ukranian military, the rebel DNR the local police, fire brigade and local council refused to become involved .The family received just one early morning visit from an official of the Ministry of Emergency Situations. Even now the family still have no real explanation as to what happened and why their house came under fire. She had no idea why they were shooting in the direction of her village she is adamant that there were no DNR checkpoints no militias posistions or activity. As far she understands the DNR are not present in her town even now. Alinna states: “Only on the maps of the Anti Terrorist Operations are the DNR located here, the people here are neutral, they do not support the Ukrainian government or the DNR. Alinna was also dismissive of the closeness to the border with Russia (Uspenka)as a reason for the bombardment , she is clear there was no passage of Military equipment from Russia certainly at the time of the assault. With absolute clarity she states “ There was only the Ukrainian Army here, a lot of them, in every village with an huge amount of military equipment. “I can not officially confirm this, but I can confidently say that it was not the militia (DNR), because they were not here – the Ukrainian Army was everywhere. I understand the National Guard fired with anti-aircraft guns on the Saur-Grave, (WW2 memorial occupying high ground NE of Amvrosivielka ) with the same success they could shoot to us. This is the kind of story known to thousands of civilians of both ethnicities across Eastern Ukraine. For thousands of civilians caught between the two armies whether on the ground or 30, 000 feet up in the air there are no good or bad guys just too many with bombs and guns. Ends. This entry was posted in News and tagged Civilian victims of Ukrainian civil war, UKRAINIAN CIVILIAN REFUGEES. Bookmark the permalink. Perceptive and interesting article; good to see due and sensitive attention paid to the Russian perspective (and the beleaguered position of the Russophone minority within Eastern Ukraine who have felt threatened for the past seven/eight years, and especially in past 12 months). Note also the potential for (re)escalating tensions arising from the recent big fall in crude oil prices, now having a seriously adverse impact on Russian state revenues and balance-of-payments. This new Russian financial and fiscal crisis looks set to raise several political temptations for Putin and his ministers in coming months.